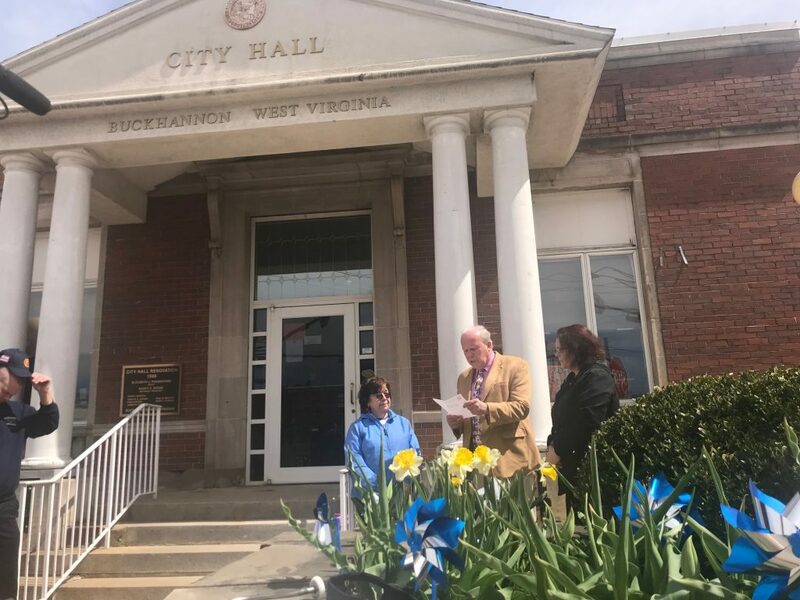 Ginny Dixon, Mayor David McCauley, and Lori Ulderich Harvey proclaim April to be Child Abuse Awareness Month in the City of Buckhannon on Wednesday, April 10, 2019. BUCKHANNON, WV: Have you seen the blue pinwheels around town? The Upshur County Family Resource Network (FRN) is urging residents to educate themselves and others about child abuse and how to recognize warning signs and prevent abuse. Child abuse and neglect remain a significant problem both nationally and locally here in Buckhannon and Upshur County. On Wednesday, Lori Ulderich Harvey and Ginny Dixon of the Upshur FRN joined Mayor McCauley and City staff in proclaiming April as Child Abuse Awareness Month in Buckhannon. The group raised the children’s flag in front of City Hall, assisted by the Buckhannon Fire Department. Please visit the Upshur County Family Resource Network Facebook page to learn more about child abuse and how it can be recognized and prevented. Media: Callie.csams@buckhannonwv.org or (304) 472-1651.